The Land Title Building is located at 1400 Chestnut Street in Philadelphia and was completed in 1898 while the annex was completed in 1902. 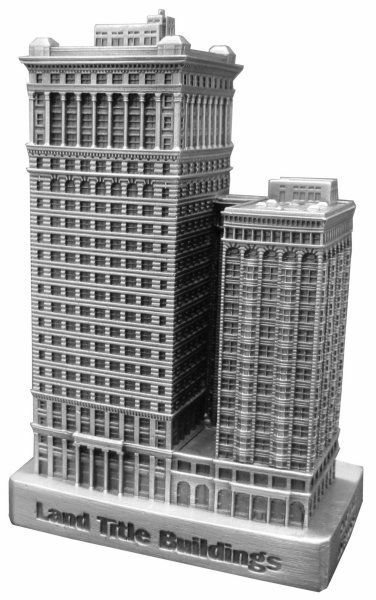 This building was designed by Daniel Burnham and stands 219 feet tall with 15 floors and the annex stands 344' with 23 floors. This pewter replica stands just over 3-13/16 inches tall and is finished in antique pewter. This model's scale is 1 inch = 100 feet. This lesser known Burnham work is paid its homage by InFocusTech. A wonderful piece!